The scriptures recommend that spiritual activities performed in the auspicious time of brahma-muhurta (one and a half hours before sunrise) have greater effect. Srila Prabhupada mandated that devotees should wake up early in the morning at 3:30 am and prepare themselves for rendering devotional service. This mandate is strictly followed by all the devotees who practice the principles of Krishna consciousness. Devotees wake up at 3:30 am, cleanse themselves according to the procedures recommended in the scriptures, wear fresh clothes, apply urdhva-pundra or vishnu-tilaka on twelve parts of their body and assemble in the temple with great enthusiasm to have darshan of the Supreme Lord. The morning program starts at 4:30 am and ends at 9:00 am. At 3:45 am the jagarana seva is offered (waking up the Deities) followed by the balya bhoga offering (the morning offering of sweet rice). After that Their Lordships get ready to receive mangala-arati, the first arati of the day. Devotees eagerly assemble to have the first darshan of Their Lordships. At 4:30 am, the conch-shells blow announcing the opening of the altar doors. A grand arati is performed by offering incense, lamp, water, cloth, flowers, chamara (fan made of yak tail) & vyajana (fan made of peacock feathers) to Their Lordships. Devotees sing Guru-ashtaka, a song composed by Srila Vishwanatha Chakravarthi Thakura glorifying the spiritual master. Tulasi is the eternal consort of Lord Krishna, and the most pure devotee, and therefore, the Tulasi plant is worshiped by Vaishnavas. Simply by worshiping her faithfully, a devotee can free himself from all material miseries. Every day, at 4:45 am and at 6:45 pm, Tulasi puja is performed in the main temple hall. There are three major aspects of Tulasi worship. The Supreme Lord appeared in the form of Narasimha, half-lion and half-man form, to protect His devotee Prahlada from the wrath of his father Hiranyakashipu, the greatest demon who defied the Supreme Lord. Lord Narasimha always protects His devotees and takes away the obstacles in their devotional service. Devotees offer Him prayers before they begin their services. An arati is performed as the devotees sing Narasimha Kirtana. After arati, they also chant Narasimha-kavacha (a prayer composed by Prahlada Maharaja and is included in the Brahmanda Purana). Devotees chant Vedic hymns like Purusha-sukta, Brahma Samhita, selected prayers from Srimad Bhagavatam, Svasti Vachanas, Sri Venkatesha Suprabhata, etc., to greet the Lord after He is awake. A full arati is performed to the Lord while devotees chant His glorification. Devotees assemble in the main temple hall and together chant Hare Krishna Maha Mantra. Chanting the Holy Names of the Supreme Lord Sri Krishna is the Yuga Dharma. Srila Prabhupada recommended that we chant at least 16 rounds (1 round = 108 times) of Hare Krishna Maha Mantra every day. By chanting, one immediately becomes auspicious and transcendental to the infection of material qualities. Behind the closed altar doors, the kautuka murtis of Sri Radha Krishnachandra, Sri Sri Krishna Balarama and Sri Sri Nitai Gauranga are offered shodashopachara seva (worship of the Deities with sixteen upacharas). As part of the shodashopachara seva, the Deities are also offered panchamrita abhisheka (a ceremonial bathing with milk, curds, ghee, honey and sweet water) and are dressed gorgeously. 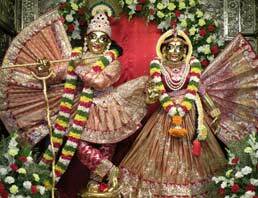 The mula-vigrahas are also adorned in gorgeous outfits and garlands. At 7:15 am, the conch shells blow, announcing the opening of Lord’s darshan. The doors open and incense smoke (dhupa) engulfs the entire main temple hall. It’s a unique experience being there in the main temple hall, witnessing the shringara darshan arati of the Lord. Every day at 8:30 am there is a lecture on Srimad Bhagavatam. After the guru-puja, devotees accept the charanamrita of the Lord and then assemble in the lecture hall. It is said nityam bhagavata-sevaya: devotees should hear Srimad Bhagavatam every day. By this process of regular hearing, all the contamination in our heart will be cleansed and the devotional attitude will develop. To watch the lectures live on our website, visit the Live Darshan page every day at 8:30 am. Their Lordships give darshan to the devotees with the opening of altar doors for dhupa arati wherein incense, flowers, chamara and vyajana are offered. Tulasi puja is performed in the main temple with tulasi pranama, tulasi arati and tulasi pradakshina. It is a spiritually enlivening experience for the devotees to witness the sandhya arati in the evening. Their Lordships are offered incense, lamp, water, cloth, flowers, chamara and vyajana to the accompaniment of Gaura-arati song with melodious music.